Summer is here and many folks are preparing for their annual family summer vacation. Whether it’s a trip to the mountains or the beach, a trek across the country to visit family, or a relaxing week at the lake, there is much to be considered when making the arrangements. One aspect of it all that I would like to delve into is the question of how to have a healthy vacation that allows one to maintain a healthy, natural lifestyle away from home and amidst the hustle and bustle of traveling. A goal such as this has its challenges, but with a little thought and preparation, it is certainly reachable. Let’s see if we can share a few tips and ideas to keep us on track health wise, even while we’re on the road. Most of us are concerned about the quality of the air in our homes, and well we should be, especially if there are any family members with allergies. But, when traveling in a vehicle or airplane for an extended period of time, or staying in tight quarters such as a motel room, the issue of air quality is just as critical, if not more so. I would suggest using a car air ionizer that plugs right into the cigarette lighter, and can be placed on the dashboard to provide fresh, clean air while you travel. It is also a good idea to have a larger but portable home unit that you can use in the motel room or at the cabin by the lake. Many of these machines are very effective at filtering out allergens and other pollutants, and are great for odors or musty smells that you might run into during your trip. I would go with ones that are based primarily on an ionizing system that includes a UV germ-killing lamp, a fan that circulates the ions and has no filters to worry about. A little ozone is all right, but too much, especially from older style ozonaters that use glass plates, can be very aggravating to some people’s lungs. This old technology gives off substances called nitrogen oxides that can cause headaches and other unpleasant symptoms for some folks as well. For plane travel consider individual air-purifiers which are worn around the neck. They are inexpensive and well worth the purchase. The next issue we want to take a look at is your water supply while on the road. This includes water you are going to drink and cook with, as well as that you will shower in. The options are many. When traveling, the best bet is to bring along some purified water from your home filtration system, preferably in glass containers. You don’t want water in plastic jugs or bottles to be baking in a hot car. Plastics, especially under such conditions, can leach harmful chemicals into the water. You can go with commercial bottled water, but it is really a gamble as to the quality of what you are drinking. Many studies have found that a lot of bottle water, even in glass containers, is actually taken right from the tap of municipal water systems. The industry is not very well regulated, so you can’t always believe what you read on the label. Another option is to bring and use a water filtration pitcher or carafe to provide clean water for your family. The only problem with this is that most of them do not hold much more than a gallon or two. However, for purifying water for cooking or meals these become very efficient and useful. Another investment you might want to make is a water bottle for each member of the family with a filter built right in. Whatever your choice, you want to make sure that you have plenty of good, fresh water available at all times, especially if the weather is hot and/or you are physically active. Once you stop for the night, or get to your destination, you have to think about the water you will shower in. This can be somewhat of a problem with some models of shower water filters. A lot of establishments might be a bit upset if you do a little creative plumbing by changing the shower head in their bathroom during your stay. There are filtering units available that are especially designed for travel applications, and you might want to consider investing in one of these. The amount of chemicals and toxins that can be absorbed just from one shower taken using unfiltered water is frightening. If you are doing any primitive camping and will be getting your water from a pump or a spring where the quality is unknown, I would suggest filtering it through a carafe and boiling it just to be sure. Some bacterial contaminants are not effectively removed by all filtration systems, so boiling is a good idea just to be on the safe side. This is a big one. Eating healthily on the road does not just happen. It takes a lot of planning and forethought. Hit the health food store and/or farmers market the day before you leave and stock up on whole, nutritious foods to munch on while on your trek. Lots of fruit, fresh vegetables, whole grain snacks, nuts, and other munchies will keep your diet in line, and save time and money for stopping to eat on the road. Usually the choices are very limited (expensive and fattening fast food), and eating junk like that will make you sluggish and lethargic when you need lots of energy to enjoy yourself. It will also throw your whole system out of whack, and probably cause you to put on few pounds as well. If you have developed the discipline to eat well at home, do not give in to the temptation to go back to your old habits just because you are on vacation. Make sure to bring along a good-sized cooler to keep perishable foods in. A cold piece of fruit can taste pretty good on a hot day, especially during a long drive or after a vigorous hike. It’s best to stay at a place where you have your own cooking facilities. This gives you a lot more control over your food choices and can save you a ton of money to boot. However, I realize this is not always possible. Try to choose as wisely as you can if you must eat out. Salad bars are usually a good option that gives you some fairly healthy choices. Hopefully you can find one that isn’t laced with MSG or other preservatives. Don’t be afraid to ask! Choosing foods like baked potatoes, steamed vegetables and fresh veggie or fruit salads will be the healthiest. If you do stock up at the grocery store, wash your fruit and veggies well. Organic sources may be hard to come by while traveling. Chances are you’ll be spending quite a bit of time out of doors while on vacation, so you really have to be proactive about protecting yourself and your family from the damaging effects of the sun. A good, natural and organic sunscreen that doesn’t expose you to a lot of dangerous chemicals is a must. Remember that whatever you put on your skin can enter your body. Sunscreens are generally classified into two major types: chemical and physical. You don’t want a “chemical” sunscreen. They act by absorbing the UV radiation from the sun, and this is very damaging and dangerous to your skin. It stimulates free radicals that can be very destructive. The best kinds of sunscreens are the “physical” varieties that act by reflecting UV. But even physical sunscreens can contain harsh chemicals, so choose wisely and read the ingredients before purchasing. Any ingredients that have long names that sound like they came out of a chemistry textbook are probably not something you want to apply to your skin or that of your children. There are some excellent natural products available that can not only protect your skin, but will nourish and moisturize it as well. If you are using a safe, effective product you can apply it often to ensure protection without having to worry. It is also a good idea to limit your time in the sun during the peak hours of exposure, typically 10am to 2pm. Wearing protective clothing is always a good idea too. Vacation is a great opportunity to wear that floppy hat you keep on the closet shelf the rest of the year. Mosquitoes, gnats, and other varmints can be very annoying, and can ruin a day outdoors if they are bothersome enough. But beyond that, it is becoming a health hazard to expose yourself to bug bites, what with West Nile virus, Meningitis, and other critical illnesses being potentially spread by mosquitoes. Tics are a big concern in many parts of the country as well, with Lyme disease being something in which to take seriously. There are some very good safe and natural products on the market that act as excellent bug repellants, but you should of course be careful and read the ingredients of anything you use, especially if you are putting it on your children. Stay away from anything with DEET in it. It works, but there are much better natural alternatives available that aren’t toxic. Some remedies that a lot of folks have had success with are supplementing with B-complex vitamins, eating raw garlic daily, or the application of an all-natural bug repellent made with essential oils. It is also a good idea to stay indoors at dusk and dawn, when mosquitoes are most active. Perform a tic check on yourself, your children, and even your pets at least once a day when you are outdoors a lot or vacationing in heavily wooded areas. We often go on vacation to “get away from it all,” but one thing you don’t want to do is totally distance yourself from the healthy habits that have no doubt taken some time and effort to build up. If you are taking a regimen of nutritional supplements, bring them along and make sure you continue to take everything according to schedule. Probiotics are very important for those times when your system doesn't adjust well to new foods, water, etc. If you have a regular work out routine, try to keep it up during your vacation, as best you can. Of course, you can substitute other activities for your usual exercise program. For example, if you hike to the bottom of the Grand Canyon, I don’t think it would be necessary to go jogging that night. 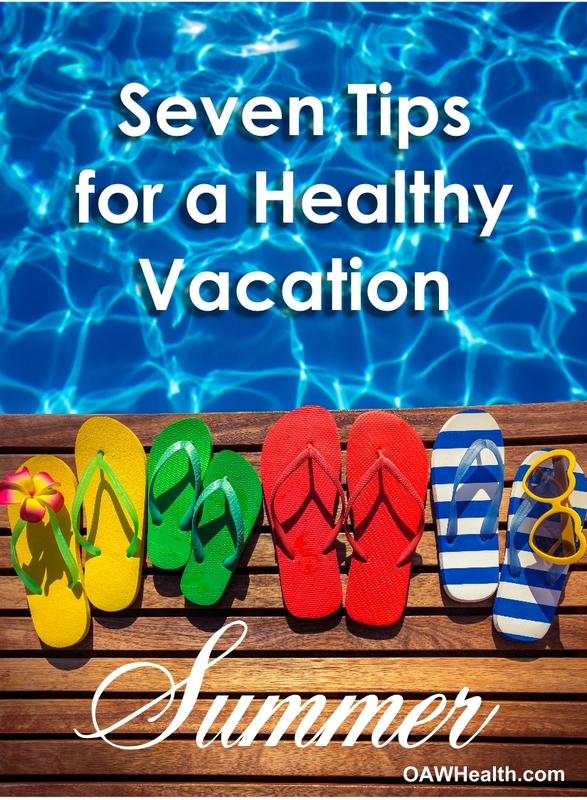 The important thing to remember about vacations is that they can be wonderfully restorative to our spirit, mind, and body, but we shouldn’t take a vacation from taking care of ourselves just because we are away from the everyday routine. If we continue to treat our bodies well, a vacation will be another step towards wholeness that can help us feel more rested and prepared for the challenges that await us after the vacation is over.